Fatal Boarding is better than the cover would suggest. Recently, I read E.R. 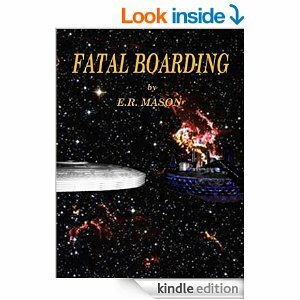 Mason’s science fiction novel, Fatal Boarding, via the Kindle app. As of this writing, it is a bargain because it is free. And, normally, if I don’t particularly like a freebie, I do not review it. I did review this one, on Amazon, and I am going to do so in a more elaborate manner here, because I did like it, but with reservations. Why did I “buy” it in the first place? The cover is pretty bad, I think, but the number of reviews and stars is impressive. Also, you can’t beat free. So, I added it to my Kindle library, and I did manage to finish it, although I thought of abandoning the effort more than once. The main character isn’t likable, at least not a first, but he did grow on me. The situation is interesting, and the author does a good job of putting in details to help the reader visualize both settings and characters. Actually, the plot line isn’t all that fresh. However, just about every story has been told by now, so all we readers (and writers) have left is theme and variation. Adrian Tarn, main character, is an experienced spacer, currently serving as security officer on a ship that has a boring task, mapping. He signed on because he lost too much money gambling, and at least a portion of his grumbling is probably intended as foreshadowing. Anyway, his rather boring job is interrupted when his ship goes a tad off course to investigate a derelict alien vessel. The reason this other ship is abandoned is a bit of a mystery, and solving this mystery becomes imperative when Adrian’s ship has malfunction heaped upon malfunction, apparently all due to the close proximity of the mystery ship. Then, folks start dying, as the title indicates. So, this is a space mystery, which evolves along expected lines, as Adrian and his fellows begin to figure out how and why both vessels are dead in space. Overall, I did enjoy the story, but the most troubling aspect is the lack of proper grammar, spelling, and/or editing. As a writer, I know it is hard to catch every little thing, especially when working on one’s own manuscript. But, Fatal Boarding suffers myriad problems, making this a distracting book to read. The author confuses “loose” and “lose” several times, and there are missing quotation marks, missing commas, odd paragraphing, and other issues. At times, I had to back up to be certain what was happening or who was speaking. Yet, 145 reviewers have rated this effort 5 stars, and another 87 give it 4 stars. That’s 228 more reviews than my space story, Trinity on Tylos, has garnered during 8 years of publication.